The Goodwood Property Owners Association, Inc. is a Louisiana nonprofit corporation, domiciled in Baton Rouge, Louisiana operating in accordance with a Second Amended Articles of Incorporation which are filed and recorded in the Office of the Secretary of the State of Louisiana. A. The name of this organization is Goodwood Property Owners Association, Inc. (“GPOA”). B. The registered address is 7515 Jefferson Highway, #119 Baton Rouge, LA 70806. A. 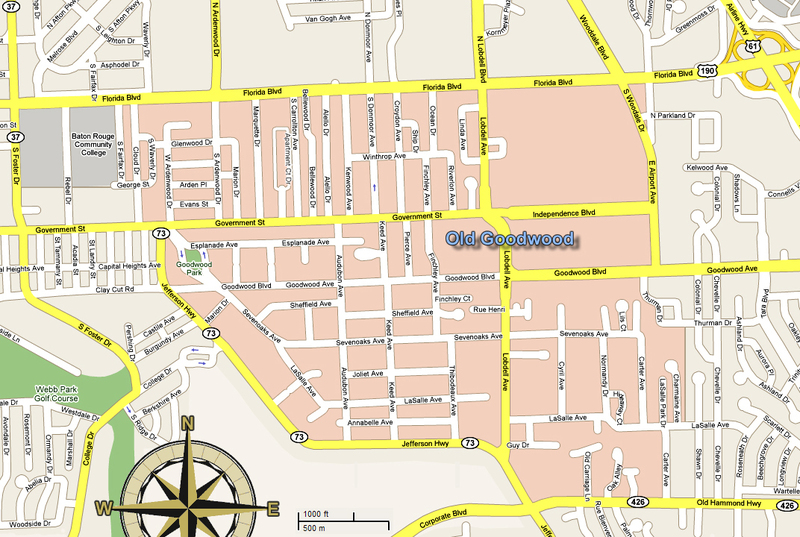 To organize the property owners in the area known as Goodwood, which is bounded on the West by a point west of S. Fairfax Drive running south from Florida Boulevard to Government Street, then to a point where Jefferson Highway intersects with Government Street, then following along Jefferson Highway in a southeasterly direction to the intersection of Lobdell Avenue and continuing in a southeasterly direction to the Old Hammond Highway, then east on the Old Hammond Highway to a point past Carter Avenue; north to LaSalle Ave., then east to include Charmaine Ave., then north to the intersection of East Airport Avenue, and Florida Boulevard and then in a westerly direction on the south side of Florida Boulevard to the intersection of Florida Boulevard and S. Fairfax Dr. on the attached map (“Goodwood”) with the intent of promoting the general welfare, security and prosperity of the area. B. To maintain the existing A-1 single-family residential zoning of Goodwood in harmony with appropriate adjacent business interests. C. To gather, receive and disseminate information helpful to Goodwood property owners and residents. D. To foster the maintenance and improvement of premises, parks, playgrounds, and other property in Goodwood. E. To assist in matters pertaining to the welfare and advancement of the Goodwood community, which a nonprofit corporation is permitted to do under the laws of Louisiana and the ordinances of the city of Baton Rouge. A. The Association’s membership shall consist of the resident households, businesses and other organizations in Goodwood who have paid Association dues. Each such household, business or organization shall be considered as having full membership, and shall have one vote and equal privileges on membership business and activities. B. Affiliated membership in the Association may be granted to persons, businesses and other organizations that support the objectives of the Association and pay the appropriate dues. Affiliated members are not required to be residents or located within the confines of the GPOA defined membership area. Affiliated members do not have voting privileges. C. Dues are set by the board of directors, apply for the twelve-month period June 1 to May 31. Dues may be paid at any time during the year. A. The affairs of the Association shall be governed by a board of directors. Directors must be members of the Association and serve a three-year term beginning on January 1. The number of directors shall be not less than nine (9) nor more than fifteen (15); and to the extent feasible shall represent the various sections of Goodwood. Terms of office shall be staggered to create a board composed approximately equally of directors serving the first year, second year, and third year of their respective term. B. Election to the board shall be at the annual Fall General meeting of the Association. The president shall assemble a slate of nominees prior to the fall meeting. Members of the board who will complete the third year of their term in December may stand for reelection to a consecutive three-year term. Candidates for new or reelected membership on the board shall be elected by a majority vote of the association members present. There shall be a term limit for all board members of (4) consecutive three-year terms. C. Board members may resign at any time by providing written notice to the secretary. Unexcused absence of a board member from three board meetings within a one year period shall constitute cause for a member to be removed from the board. Any officer may excuse an absence and will so announce at the meeting missed by the board member. D. If the number of directors drop below nine (9), the president shall nominate a sufficient number to restore the number to nine (9). All such candidates will be elected by a majority of the directors present during the board meeting at which their names are presented and will become members immediately. Regardless of the month in which such members are elected by the board, they will be deemed as fulfilling the term of the vacated position. A. The officers of the Association shall be: president, vice president/president elect, secretary, and treasurer. The outgoing President, or such officers as may be designated by the outgoing Board of Directors, shall call together, in meeting, the newly elected Board of Directors, within fourteen (14) days after their election. The said Board shall elect from its own number a President, Vice President, Secretary and Treasurer, and such other officers as the Board may consider necessary. If there are more than two candidates for an office, election will be by plurality vote. Candidates for office must be members of the board. The term of office shall be for the calendar year following the year of election. B. The current vice president shall normally become president at which time the position is vacated. 1. The current president may be elected to serve a consecutive term. 2. Any other member of the board may be elected to the office of president. D. There is no limit on the number of times a person may serve as an officer. E. An officer may resign office and remain on the board by providing written notice to the board. Unexcused absence from three board meetings shall constitute resignation from office and from the board. The president or vice president may excuse an absence of an officer and will so announce at the meeting missed by the officer. F. A vacancy in the office of president shall be filled by the vice president. Vacancies in other offices will be filled by election at the board meeting at which the vacancy is announced. The president will provide the name(s) of nominee(s) and will open the floor for additional nominations. Election shall be by a majority vote of the board members present or, if there are more than two candidates, by a plurality vote. A. The board of directors shall manage the affairs of the Association in conformity with the provisions of the Articles of Incorporation and by-laws. It shall outline and direct the duties and activities of the officers of the Association, determine the amount of the annual Association dues and approve the annual budget. B. The president shall have general supervision of the affairs of the Association. The president shall preside at meetings of the Association and shall be ex-officio member of all committees. The president or the presidential designee shall publicly represent the Association and sign correspondence issued in the name of the Association. C. The vice president shall discharge the duties of the president in the event of his/her absence and shall perform other duties assigned by the president or the board. D. The secretary shall keep a record of the transactions of the Association, issue notices and announcements, record the minutes of board meetings, keep a record of attendance of board members at board meetings and notify the president of unexcused absences, and perform other duties assigned by the president or the board. The secretary shall be the custodian of the Association charter, by-laws and records. The secretary shall maintain minutes and other records on file for a period of three years, including the current year, or as directed by the board. E. The treasurer shall receive monies due the Association and deposit them in the name of the Association in a depository as directed by the board. The treasurer shall draw checks on the Association’s depository as required to cover obligations incurred by the Association. Checks in the amount of $500.00 or less shall be signed by an approved director. Checks for an amount exceeding $500.00 shall be signed by two approved directors. The treasurer will report, in writing, on the financial status of the Association at each meeting of the board and perform other duties assigned by the president or the board. A review of the Association’s financial accounts and treasurer’s procedures shall be performed by the Executive Committee in January. The treasurer shall maintain financial records on file for a period of three years, including the current year, or as directed by the board. F. The treasurer shall issue payroll checks for the Private Police Patrol (PPP) services. PPP checks will require the signatures of two approved directors for amounts exceeding $1,500.00. A. The Association officers plus the immediate past president shall comprise the Executive Committee. This committee shall meet to handle items of business requiring prompt action between regular meetings of the board. Such action must be reported by the president at the next meeting of the board and are subject to ratification by the board. B. The president shall appoint the chairperson of the following standing committees to serve during the president’s tenure in office. 1. Grounds: The Grounds Committee shall be responsible for developing and implementing programs to maintain, enhance and recognize the natural beauty of Goodwood (i.e. Yard of the Season, contracting with landscapers, organization of clean-up days). 2. Communications: The Communications Committee shall issue newsletters to residents, affiliates and other interested parties on a schedule directed by the board. The committee will maintain the Association’s telephone and e-mail lists. The committee will also receive and disseminate information as directed by the president or the board. 3. Social: The Social Committee shall develop programs to foster goodwill among Goodwood residents and that activities associated with the general membership include social and hospitality activities. The committee will also develop and plan events designed to bring the membership together. 4. Membership: The Membership Committee shall develop and implement plans to increase paid association membership as well as corporate sponsorship throughout the neighborhood. It will work to insure new residents are welcomed. 5. Safety/Police Patrol: The Safety and Police Patrol Committee shall coordinate the activities of the security patrol, provide a monthly report to the board, and implement other programs directed by the board associated with security. 6. Zoning and Planning: The Zoning and Planning Committee shall maintain a file of current pertinent zoning ordinances. It shall review all proposed zoning changes and changes in restrictions in Goodwood and recommend appropriate action to the board. The committee shall also seek enforcement of deed restrictions and zoning ordinances. The committee will notify residents whose property are the source of complaints and coordinate with appropriate CityParish officials to attempt to correct problems. 7. Website: The Website Committee will focus on maintaining, developing and implementing the technology to utilize the Internet for the benefit of the Association. This may include data collection as well as dissemination of information to the board and members via the available technology. C. From time to time the president may appoint or dissolve other committees. Examples include Long Range Planning, Nominating and By-laws. D. The president has the authority to appoint a parliamentarian, and representatives to organizations that align themselves to the mission of the Association and other organizations as directed by the board. A. There shall be bi-annual general meetings of the Association held in the spring and fall designated by the board. The fall meeting will be held for the express purpose of electing board members and officers for the following year. Notice of the meeting shall be made to Goodwood residents at least thirty (30) days prior to the meeting. Residents must have paid their dues for the current year in order to vote for directors. B. Meetings of the board will normally be held on the third Tuesday of every month. Board meetings will be publicized at least twenty-four hours in advance. All board meetings are open to all GPOA members. The president, with the concurrence of the majority vote of the Executive Committee, may cancel a board meeting or Executive Committee meeting. C. A special meeting of the board may be called by the president or by petition of seven members of the board, provided at least forty-eight hours notice is provided to all board members. The rule of a quorum (section D) applies to special meetings. D. A minimum of twenty-five (25) Association members attending the fall meeting shall constitute a quorum for the election of board members. A majority of the current Board of Directors attending a Board meeting, either in person or through telecommunication, shall constitute a quorum for the transaction of business. Any member of the Board of Directors may be represented for the purpose of a vote at any meeting of the Board by any other Board member, when authorized by written proxy. No more than one (1) proxy vote can be assigned to each Director in attendance for the purpose of a vote. A board member or officer may be removed from office for cause by a three-fourths vote of members of the board. Also, a board member or officer who misses three meetings with no reason stated will be removed from the board. Amendments to the by-laws must be submitted in writing one board meeting in advance of the meeting at which a vote on the amendments is to be taken. The by-laws may be amended by a majority vote of the board members present. Robert’s Rules of Order shall govern matters of parliamentary procedure at all meetings. Any article or amendment to these by-laws in conflict with the Articles of Incorporation of the Goodwood Property Owners Association, Inc. shall be void. Bennett & Bennett Associates, Inc.